Make your workplace work for you. If better health, freedom of movement, ﬂexibility and improved comfort are your goals, the Uprite Ergo Height-Adjustable Sit2Stand Workstation could be the perfect fit for you. Transform your desk or cubicle instantly into a standing workstation with the touch of a lever. Industry-leading 18" (45.7cm) vertical height adjustment fits most users. Small footprint, slides easily out of the way to free up desk space. Support two monitors with 6.5lbs to 21lbs total weight. 27.5" (69.9cm) keyboard tray allows space for full size keyboard and mouse. Slide-in, slide-out work surface for additional workspace. On-board cable management keeps area neat and organized. Single action quick release lever adjusts from sitting to standing in seconds. Locking lever maintains the unit firmly in position at any height. Telescoping vertical column ensures a low profi le in the seated position. Durable anodized and powder coated aluminum and steel surfaces (95% recyclable components). Simple assembly, no special tools required. EASY SIT 2 STAND: The Uprite Ergo Sit2Stand moves effortlessly from sitting to standing in seconds with the pull of a locking actuator handle. LARGE WORK AREA/SMALL FOOTPRINT: Monitors mount to the column leaving ample room for a full size keyboard and mouse plus a slide-in/slide-out work surface for all other needs. 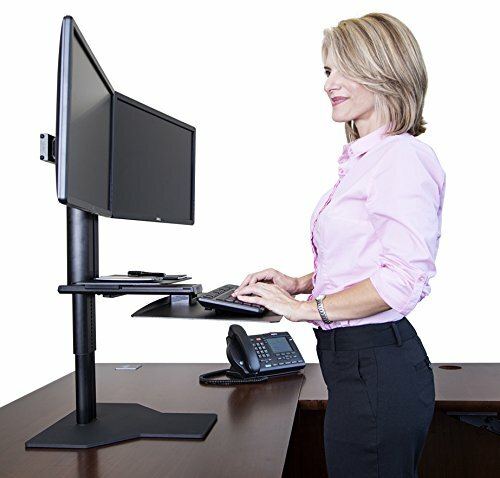 A compact but very stable solid steel base saves space on your desk and felt pads under the base allow you to slide the Sit2Stand on your desk to better position or make room when not using your computer. ERGONOMIC DESIGN: Class leading 18 inches of height adjustment with 23 individual height settings accommodates almost all users. Monitor mounting allows correct monitor positioning to fight "Tech Neck". ATTRACTIVE DESIGN AND QUALITY: The sit to stand is made of anodized and powder coated aluminum and steel providing a durable and attractive unit. Innovative cable management systems keeps cables out of view. EASY ASSEMBLY: Can be assembled by one person in minimal time. All necessary tools are included. If you have any questions about this product by Uprite Ergo, contact us by completing and submitting the form below. If you are looking for a specif part number, please include it with your message.